The Blood of Tyrants is clearly satirical so it is easy to overlook how preposterous it is." > The Blood of Tyrants by Peter S. Fischer, a Mysterious Review. 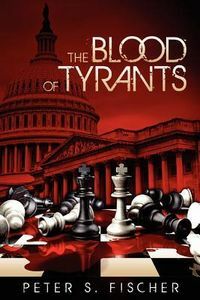 Review: Peter S. Fischer, the creator/producer of the classic television series Murder, She Wrote, takes on the Washington political establishment in his first novel, the murder mystery thriller The Blood of Tyrants. Disgraced reporter Paul Castelli has reinvented himself as Paul Castle, host of National Heartbeat, a cable television show that exists less to report the news than to make it. In what can only be described as the story of his career — any reporter's career — he inadvertently stumbles into the middle of a political firestorm that will soon rock the nation: the murders, some staged as accidents, of over a dozen of the country's most powerful representatives. Followed by homicide detective Aaron Kovacs and FBI agent Fowler Briggs, Castle tries to keep one step ahead of the authorities in an effort to put an end to the killings that are terrorizing the country. The plot in The Blood of Tyrants is clearly satirical so it is easy to overlook how preposterous it is. Still, conspiracy theorists among any number of political groups will no doubt find something to pique their interest here. To be sure, the plot moves along rapidly, the characters well-developed without being too much like caricatures, and though the outcome is fairly predictable (the whodunit aspect is never in doubt), the path there is exciting nonetheless. The author, a familiar name in crime dramas, adds a little humor here and there with references to TV shows; here's a passage when Castle hits New York City to learn more about the murders: It all looked so easy on television when Rockford did it, or Kojak or Columbo. Nose around, ask a few questions, wave a few Andrew Jacksons about and the information spilled forth like water over Hoover Dam. Somehow these guys missed the Westin Hotel in midtown Manhattan. The way people were eyeing him, you'd think he was there to steal the silverware. The reading experience is marred to some extent by rather sloppy editing, mostly typesetting issues, but also numerous misspelled words and missing punctuation. For an experienced screenwriter of this caliber, it seems incongruous in his debut novel. Acknowledgment: Grove Point Press provided a copy of The Blood of Tyrants for this review.